The HA4500 Test Stand has been designed for the diesel specialists with requirements for testing the larger multicylinder and medium sized single cylinder fuel pumps. 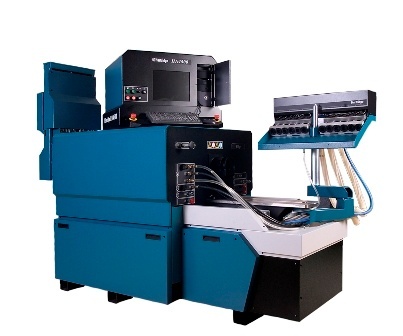 The HA4500 Test Stand is based upon technology proven in HA3000, PGM and AVM2-PC test benches. The HA4500 is a cost effective, easy to use, and accurate test stand which will test a wide range of diesel fuel pumps. High torque 35 kW DC drive motor. Direct drive system – DC motor is directly coupled to the flywheel. Electronic feedback system providing negligible speed drop between full load and no load positions of the injection pump. 12 line electronic fuel measuring system (spm) or open top graduate metering. 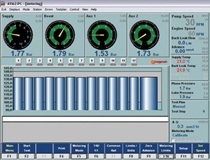 Pump advance and rack measurement displayed digitally. Turbo boost pressure and phasing displayed digitally. Versatile test platform for multi cylinder or single cylinder applications. Strong construction and proven easy to use ergonomic design. Compact size for easy installation. cylinder pumps with additional single cylinder cambox mounted on bed plate. World wide spares availability and customer support. Enhanced accuracy of pump testing coupled with efficient operation. Significant increase in speed of test with electronic metering option. D.C Thyristor controlled, 35KW (47 HP). Closed loop speed control system with integral control giving zero steady state droop. Speed selection via a pc, with analogue speed trim adjustment of 10% for governor testing. Acceleration rate of 400 RPM per second. Ability to store/ select 6 commonly used speeds. Nudge function to orientate drive to aid pump mounting. Inertia – 5.3 kgm2 (126 lbft2). Air operated brake for emergency stopping. Anti-backlash coupling 600 mm2/stroke ISO rating rating or solid oldham drive coupling (optional). Suitable for 75, 90 and 120 mm drive couplings. Adaptors available for most drives. Calibration System 12 line electronic metering system (spm) or open top graduate. Digital display, resolution 1 rpm speed, stability ± 1 rpm. Gauge. 1 bar to 7 bar, 30 in Hg to 60 psi (8 bar option available). 0 to 7 bar/0 to 100 Psi. 0 to 11 bar/0 to 160 Psi. 0 to 45 bar/0 to 650 Psi. Range +/-10 mm, Resolution 0.1 mm. Range 30 mm, Resolution 1.0 mm. Injector Mount Quick release injector mount to accommodate up to 12 off ISO4010, ISO orifice plate and ‘T’ size injectors as well as other common types. Phasing Low pressure spill and high pressure spill phasing as standard. Optional electronic phasing (0.1° resolution display). 0 to 45 bar / 0-650 psi. 100 litre capacity/22 imperial gallons. Display resolution of 0.1 temperature reading accuracy +/-0.2°C. System temperature controlling to +/-2°C. The default setting is 40°C but 25-65°C can also be set as an alternative. 250 l/hr at 50Hz and 300 l/hr at 60Hz. Pressure 0-7 bar/0 to 100 psi. Tank 14 litre capacity/3 imperial gallons. An external calibrator HB219 which has a 1000 cc capacity can be fitted externally for measuring output from larger single cylinder pumps. Variable between 1 and 9999 with the ability to store/select 8 commonly used shots, e.g. 50, 100, 150, 200, 300, 400, 500 and 1000 (applicable to the external single cylinder calibrator HB219). A cambox kit is available for testing single cylinder pumps of C & CC up to 22 mm lift. The cambox has an integral flywheel giving additional inertia of 1 kgm2. A module loading trolley AC79 to facilitate assembly and storage is also available. Two D.C Supply outputs of 0-24V at 3 amps, which can be parallel, connected to give 6 amps. Multipin 110V connector (for external single cylinder calibrator (HB219). Real time clock display. Socket for advance and rack transducer. 3 Phase 380 – 440V 120 Amps 50Hz. 3 Phase 420 – 480V 120 Amps 60Hz. 6 bar (90 psi) Min: 8 bar (120 psi) Max. 8 lt. (1.7 imp gallons)/ min; 20°C Max temperature, pressure from 1-5 bar pressure. The HA4500 Test Stand is supplied with anti backlash drive coupling, pressure phasing and lube oil supply.